Today was another day to explore Tokyo! Although I had visited late last year, Kate had yet to visit Kappabashi-dori which is street in Tokyo where you can buy absolutely anything you could possibly need to establish and maintain a restaurant. Apart from food that is. This includes; crockery, utensils, chairs, dishwashers, ovens, dishes, pots, pans, stoves, signs, lanterns, decorations, automatic ordering machines as well as the plastic and wax food samples that are commonly used outside Japanese restaurants to show what the food looks like. Some stores are generalists though quite a few only sell one type of product, for instance there are many stores selling knives and some these have been doing so for centuries and transitioned from sword making in the feudal era. I actually visited last year to buy Kate some knifes as she enjoys cooking, but was suffering with some cheap utensils from K-mart. Of course she was quite keen and excited to visit this street for herself! Similar to yesterday we couldn't head there straight away as shops in Japan don't usually open until mid to late morning. So after a bit of a slow start in the morning, which included a nice buffet breakfast at the Richmond Hotel Mejiro, we caught the Yamanote line train down to Shinjuku to buy bus tickets for tomorrow's trip to Mt. Fuji. As we were planning to climb up during the day we wanted to make sure we had enough time to get the last bus back which meant leaving as early as possible at 07:40. Getting the tickets now meant we would not have to worry about buying tickets that early in the morning, or finding the bus stop. There was a bit of mayhem at the stop when we arrived and we found we could not buy tickets from the main area. Instead we had to go up to the second floor, which was helpfully marked with signs, but still a little tricky to find (there is a door from the bus platforms, and then some stairs). At the top there was a little room with lots of chairs, and two people selling tickets. We told the guy what we wanted and he printed out the wrong tickets for us. After handing them back he quickly realised his error and printed out the correct ones. Hooray! All in all he wasn't too friendly though. After buying our tickets we went over to Shinjuku station where Kate bought some delicious custard filled pastries. These were expertly wrapped and an icebrick was placed inside to keep them cool. From Shinjuku we then caught the Marunouchi metro line to Akasaka-mitsuke and then changed to the Ginza line, arriving at Tawaramachi station half an hour later. On the way to Kappabashi we passed a lot of stores selling funeral goods such as urns and statues and butsudan, which are household shrines that are used to display religious ornaments and hold pictures of deceased relatives. 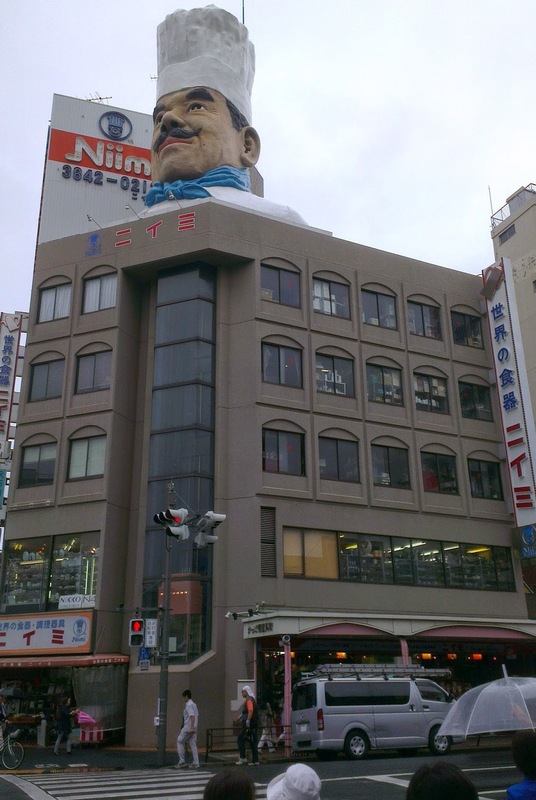 Before long we found the giant chef head that marked the start of Kappabashi Street! It was around this point that Kate opened up her pasties and squirted cream everywhere! I was allowed a try of them and could confirm that they were absolutely delicious. Kate had lots of fun looking at the different goods on sale, and I was able to appreciate it better with her explaining to me what a lot of things were for. Kate wanted to buy lots of things but decided, due to the plane trip, to settle on some letters that can be used to put words into biscuits. The street layout seemed different from when I visited last time and seemed shorter in one direction and one of the cross streets seemed a lot longer. 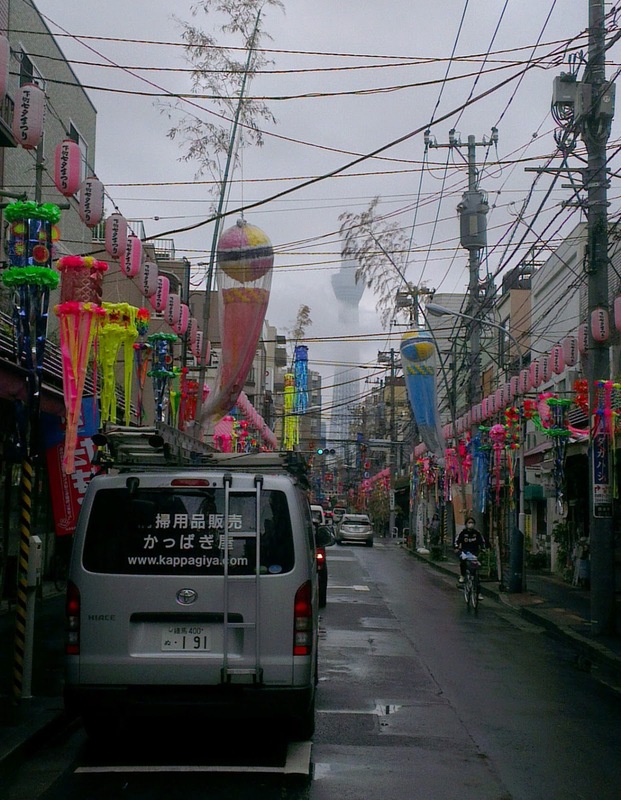 This cross street was decorated for Tanabata and looked pretty cool with the Sky Tree visible in the distance- pity I had left the big camera at the hotel! After Kappabashi we headed to Akihabara and looked in some shops, I think Gamers, Animate and Mandarake as well as the stores in Radio Kaikan where we found lots of reasonably priced figurines. From either animate or gamers I bought the latest volumes of the Yuru Yuri and Nichijou manga. Unfortunately I only got the standard version of Yuru Yuri volume 11 and missed out on something I saw bundled in at other stores. I bought a flat key chain of Miyanaga Saki from -Saki-, and lost a lucky dip by winning some sort of weird baseball figurines. I don't think there was anything good in there anyway! We also had some fun with the UFO and capsule machines! Kate won a small Himuro figurine from Kuroko's Basketball and Azusa from The Idolmaster. She's very good at the variety where you have to use a stick to pull down a rope that a prized is attached to and managed to win me a Dekomori figurine after only two tries!! After Akiba we were pretty hungry and once again returned to Mejiro to have dinner at Ōtoya. To go with our meals we also ordered some Nihonshu (Sake) each which was very reasonably priced and delicious! Tomorrow we were scheduled to climb Mount Fuji so we made sure to stock up on snacks and have an early night! Continue and read about our climb up Mount Fuji! Off-topic question, if I may. I wonder if you have a Blogger widget for displaying a list of post titles with links, or if you enter the links manually? The archive widget doesn't seem to want to display post titles. No worries, yes I tried to do that with the widget but found the archive widget to be pretty uncustomisable. Thank you for sharing your travel information. I have also been bitten by the Japan travel bug, but only chanced upon your blog now, and I have bookmarked it! I'm gleaning information from your blog on the places that I will be heading to next. My husband and I, and our 4 kids visited Japan in 2011 Dec (28 days), 2013 June (28 days), and our 3rd trip is coming up in 2014 Dec (24 days). On our first trip, we stayed with Toyoko Inn chain of business hotels (free breakfast!) as it fitted our needs perfectly. Two of my kids were below 12 then, and they allowed us to book 2 double rooms (for 6 people). It was great because they offered a free single room for every 10 nights. I just paid a little bit to top up the free single room to a double room. We got 2 nights of (almost) free hotel stay, and only chose to use the free nights in cities that were more costly. This members' deal is available. Hopefully, fellow travellers will find it useful too. Thanks again! Thank you very much for taking the time to read my post and leave a comment! 28 days would be fantastic, so far the longest we've stayed is around three weeks- Jealous! Yeah we've stayed at Toyoko quite a few times, they're pretty reliable and it's great that you were able to get double rooms like that. We only recently realised about their members deal, and will have to sign up next time. They also have a special low rate if you enter after 12:00am, though that's a bit of an unreasonable time. Another chain we've enjoyed is Comfort, and we were very impressed with the Dormy Inn in Kanazawa. Oh and Richmond can be good too. 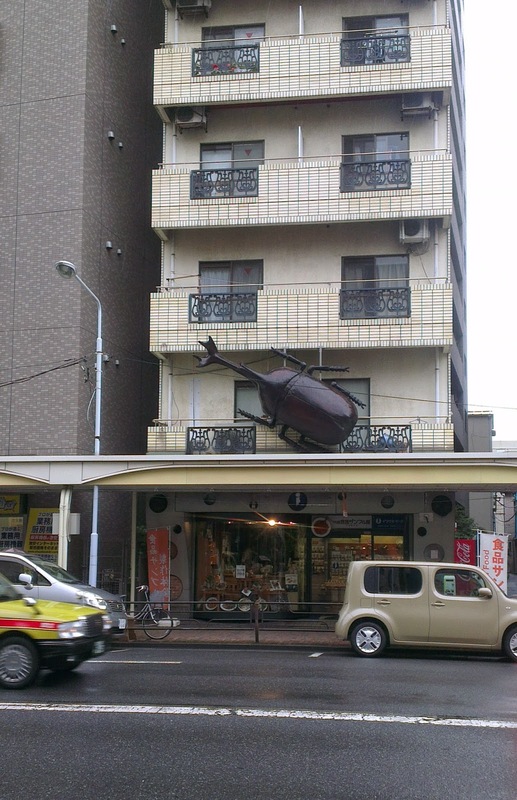 Planning a trip to Japan and found your blog. Interesting read! Hopefully you can find something that will help you plan your trip! Let me introduce myself, My name is Sam Wong, a HongKonger who love travel. Two months ago, I had created a travel site which aims to connect the bloggers and the tourists. Bloggers can share the link of their articles and let tourists find the useful travel articles more easily. I know you love travel and you write a lots of articles about Japan, so I would like to invite you to share more articles on my site and let more tourists can know more about your story in Japan. Look for your reply, hope you all the best!